Oceanfront 6 Bedrooms and 6 bathrooms very well maintained beach home. Fully equipped kitchen with dishwasher and microwave. Open floor plan with large dining area and extra seating at the kitchen bar. Comfortable living room with lots of seating, large television and DVD player. Wireless internet access included and two additional flatscreen televisions in bedrooms. Unlimited domestic long distance phone service included. Private, direct walkway to the beach, beautiful gazebo over the sand dunes, outside shower. Non-smoking, no pets. 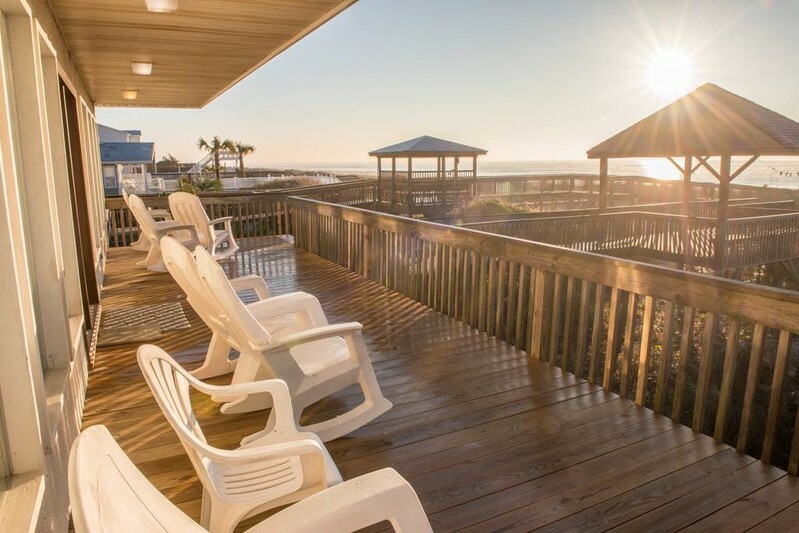 1 Queen/1 Double.Oceanfront 6 Bedrooms and 6 bathrooms very well maintained beach home. Fully equipped kitchen with dishwasher and microwave. Open floor plan with large dining area and extra seating at the kitchen bar. Comfortable living room with lots of seating, large television and DVD player. Wireless internet access included and two additional flatscreen televisions in bedrooms. Unlimited domestic long distance phone service included. Private, direct walkway to the beach, beautiful gazebo over the sand dunes, outside shower. Non-smoking, no pets. We thoroughly enjoyed everything about our stay, especially "our" great house! This was our seventh year in a row so we kinda feel like it's our summer home! Please let the owner know we really appreciate the new additional shower. It came in handy for our crowd! See you next summer. We had a fantastic stay here! Beautiful house had our eye on this rental for a long time! This year was our lucky year, the extras this house had to offer has been Great! The weather has been wonderful! !Enjoyed the time with family and relaxation, this year has been our 26th year, we will see you next year! Great house, great location, great weather, great time! Our annual Easter week at the beach was just as expected..Wonderful! The house was perfect for a family with kids.